Ralph Lauren is a global fashion brand that produces apparel, accessories, fragrance collections, and home furnishings. The brand is known for its distinct American perspective and innovative branding. With Big Apple Buddy’s personal shopping service, you can now buy the latest pieces from the USA Ralph Lauren online store anytime, anywhere. 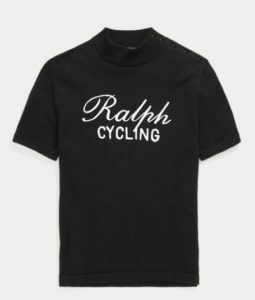 Shop Ralph Lauren’s newest Purple Label line which is inspired by competitive cycling of the past. Check out the mockneck Ralph Cycling Embroidered Wool Sweater in all black. If you prefer a splash of color, try out the Virgin Wool Half-Zip Sweater that comes in a mix of black, salsa, and cream. Looking for a new piece for the Summer? Channel your inner sailor and with an outfit from the Polo collection. This season’s line features warm blues and crisp whites. This Floral Silk Wrap Dress is perfect for a night out in the Summer. Ralph Lauren creates more than just gorgeous clothing. Ralph Lauren has a large selection of lovely bedding collectionss to choose from. 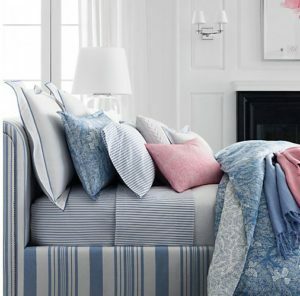 The Meadow Lane Bedding collection comes in soft pinks and blues and has a plethora of fun throw pillows and blankets to choose from. Ralph Lauren stores are located worldwide, however the the USA Ralph Lauren online store stocks exclusive pieces that cannot be found anywhere else in the world. The USA Ralph Lauren online store unfortunately does not offer international shipping to all countries outside the US. Not to worry though! Big Apple Buddy, your personal shopper, can help you buy products from the the USA Ralph Lauren online store and ship them to your doorstep, no matter where you are in the world. We offer international shipping to over 110 countries including Australia, Austria, Azerbaijan, Bahrain, Belgium, British Virgin Islands, Brunei, Bulgaria, Canada, Chile, Costa Rica, Croatia, Czech Republic, Denmark, Estonia, Fiji, Finland, France, French Polynesia, Germany, Gibraltar, Greece, Greenland, Hong Kong, Hungary, Iceland, Indonesia, Ireland, Israel, Italy, Japan, Jordan, Kuwait, Latvia, Liechtenstein, Lithuania, Luxembourg, Macau, Malaysia, Maldives, Malta, Marshall Islands, Mauritius, Monaco, the Netherlands, Netherland Antilles, New Zealand, Norway, Oman, Poland, Qatar, Romania, San Marino, Saudi Arabia, Serbia and Montenegro, Seychelles, Singapore, Slovak Republic, Slovenia, Spain, South Africa, St. Lucia, Sweden, Switzerland, Taiwan, Thailand, the UAE, the UK, Vatican City, and Vietnam. If you would like to buy from the the USA Ralph Lauren online store, simply let us know which items you would like to order (by filling out the form below) and we’ll get back to you with a free international shipping quote within 24 hours!